Gaia Sagrada is a dream I have had for a very long time. Now it is manifest. Life is the teacher. YOU are settting all this stuff up for yourself to learn from. It is not coming from outside of you. 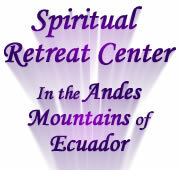 Why Gaia Sagrada Spiritual Retreat Center? Gaia Sagrada is a dream I have had for a very long time. I and others have worked very hard for more than a decade to bring this about, starting with Wisdom of the Heart Church, the distance learning school University of Metaphysical Sciences, and finally there is now a place for live classes, workshops and retreats. Anyone who cares to participate, students of UMS and non-students alike, now it is affordable for everyone to experience a retreat. I have always wanted to create a place for people of ordinary means could actually afford! I have always wanted to bring like minded people together to study spiritual concepts in a beautiful setting. I have always wanted to create a modern day mystery school where awakening people could discover the secrets of the universe (which aren't so secret anymore!) and explore all the techniques and methods that could enhance conscious awareness. 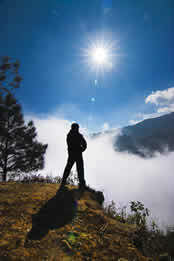 My love for nature and its darshan (blessing from a master) is how I came up with the name. Whenever I feel sad or discouraged, I just go lay on the ground or sit in nature, and I'm always healed. The deeper the sadness or injury, the longer I partake of Mother Earth's blessing. That is my personal favorite method for return to balance. There's something magically healing about the Earth's energy. Sure, I know about the frequencies of the Earth, the science of it, but there is something more to it than that. I believe the Earth is a sentient being of some sort or another, and somehow we are part of this sentient being. When we tune into her we heal on whatever level we need to, awaken to truth, and reach inner peace where the mind is still. There has never been a spiritual master in my life who could give darshan like the Earth can! When I hug the Earth, she hugs me back, it seems. This property in Ecuador where Gaia Sagrada is located is one of the most beautiful places I have ever seen, nestled in the Andes Mountains. It is always green and lush, nurturing and gentle. There is also a wonderful community of Ecuadorian people. Many are farmers, whom we have become friends with. It is so safe and magical here. There is something really special about this place. A vortex of some sort. There aren't many insects, almost NO mosquitos, and this land is very conducive to spiritual, emotional, mental and physical healing, which is the mission of Gaia Sagrada. Nature is quite the helper in expansion of consciousness. We looked at land in Ecuador for two years before we finally came across this one. We knew immediately that this was the place. We didn't even have think about it. There is some sort of special vortex of peace and serenity here on this land. Land exactly like this is rare indeed, even in Ecuador. I invite you to come and explore yourself deeply and completely. You are an incredible and beautiful mystery that will take a lifetime to uncover. 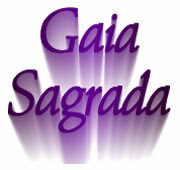 We are all here to serve you at Gaia Sagrada. The atmosphere here is perfect for healing and growth, and your life will change for the better. All you must do is dive deep within and experience your eternal nature. You will find that life is much different than you ever thought possible. We are here to help you experience that. Come sit with me in the grass, make new friends with all the beautiful people who come here, and enjoy the magic that is waiting for you here. Gaze at the stars, the moon and the fireflies, or sing by the campfire. Be at peace without a care in the world while you're here, because you will indeed feel as if you have gone to heaven for a little while. Watch the clouds in the valleys clear in the morning, and enjoy the bluest skies one has ever seen, all the while in a never-ending, lush, green landscape. The sun sparkles as if everything is cleaner here than most places in the world. Let yourself be blessed here and awaken even more to who you are. Our goal is your enlightenment. Of course, enlightenment (to know) is a lifelong process, and you never stop "getting enlightened" or "knowing" more about who you are and the universe itself. 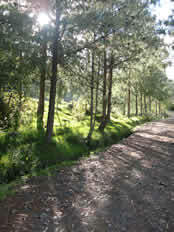 However, let's walk together for a little while on this unfolding path in your life. You are an opening flower, always, and Gaia Sagrada is a perfect place for flowers to open a little bit more. We are here for you. 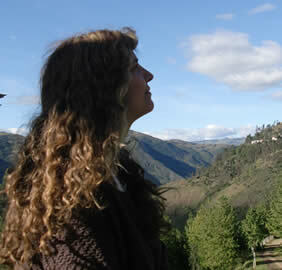 Christine Breese lives and works at Gaia Sagrada Spiritual Retreat Center near Cuenca, Ecuador. She is available in person at Gaia Sagrada. Christine offers the sayings in the sidebars that you see on this site. 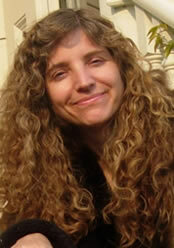 Many of these quotes are excerpts from her satsangs, workshops, and retreats. If you would like to read and see her articles and video satsangs, visit this page. Come sit with me in the grass, make new friends with all the beautiful people who come here, and enjoy the magic that is waiting for you here.